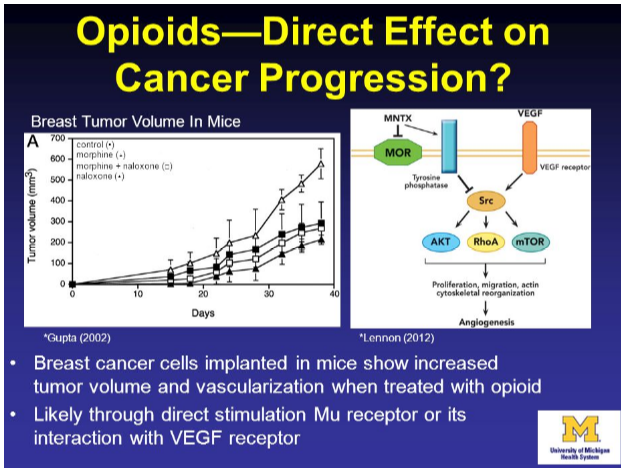 If an MD gave you a prescription and told you it would make your tumor grow or worse would create metastases or stimulate progression of the cancer, would you take the drug? Most tell me: absolutely not �C are you crazy? Yet, when I tell them their doctors are doing this routinely they draw back from me for daring to suggest their doctors are prescribing drugs that are increasing the cancer they are trusting the doctors to treat and shrink. Patients and family members need to know the dangerous effects of morphine, both in the progression of the cancer you are trying to fight and overcome to the ability to live as long as possible. When a doctor prescribes morphine you need to question why. If you want to live and beat your cancer you need to protect yourself by demanding a pain relief that is not an opioid that will further your cancer’s progression. No one should prescribe morphine with an attitude that you need to die with dignity �C it is not their choice �C it is always your choice and right to live and fight the cancer.